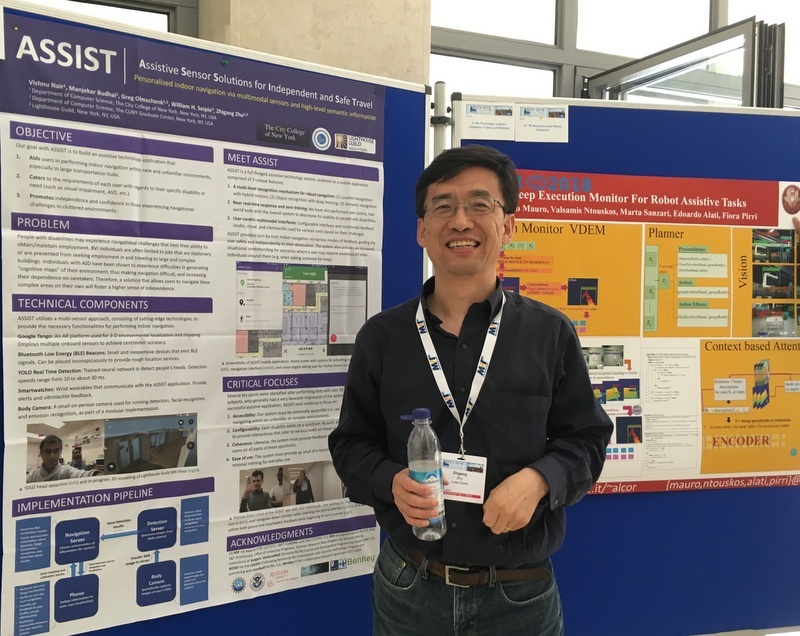 CCNY computer scientist Zhigang Zhu at a conference in Munich, Germany, where he presented his research on ASSIST. Navigating a busy airport or bus terminal can be a challenging proposition for anyone, let alone the visually impaired or disabled. Enter ASSIST, an app for indoor navigation in development by a City College of New York-led consortium. The ASSIST app is part of the SAT-Hub project, which has received a boost from a $750,000 three-year grant from the Partnerships for Innovation (PFI) Program at the National Science Foundation. This brings to $850,000 the NSF’s support for the app’s development. Last year, the foundation awarded City College a $100,000 Smart & Connected Community (SCC) planning grant. In addition, Bentley Systems, Inc., a software development company and the primary industrial partner on the SAT-Hub project, is providing an additional $75,000 over three years in industrial support. SAT-Hub stands for “Smart and Accessible Transportation Hub”. The acronym for “Assistive Sensor Solutions for Independent and Safe Travel,” ASSIST will provide GPS-type assistance to users ranging from the blind or visually impaired to autistic and disabled people. “It will help them navigate large public transportation hubs such as airports and bus stations which can be very complicated for the visually impaired or autistic,” said Zhigang Zhu, Herbert G. Kayser Chair Professor of Computer Science at City College and the project leader. According to Zhu, ASSIST will help users find the best path to avoid foot traffic, tell them where they are and how to get to their destination. The primary research is being done in CCNY’s Grove School of Engineering, where Zhu, who also teaches at The Graduate Center, CUNY, directs City College’s Visual Computing Laboratory. CCNY students, both graduate and undergraduate, are engaged in the research. CCNY’s major research partners include Rutgers University which carries out research in building modeling and transportation management, and the not-for-profit Lighthouse Guild, dedicated to reducing the burdens of vision loss and to improving the quality of life for those with reduced vision. The SAT-Hub project started with a Summer Research Team project led by Zhu at Rutgers’ DHS Command, Control and Interoperability Center for Advanced Data Analysis. Lighthouse Guild joined the team for testing the app with users. Click here for a YouTube video of SAT-Hub’s potential. “Credit to Dr. Zhu for organizing a prodigious team of partners working together to bring a much-needed technology to the market-place,” said Arber Ruci, director of the New York City Innovation Hot Spot and Entrepreneur-in-Residence at the New York City Regional Innovation Node. A 2012 CCNY alumnus, Ruci is a co-principal investigator and commercialization lead of the project. The Borough of Manhattan Community College, Goodwill, New Jersey Passaic County, New Jersey Transit, the New York City Mayor’s Office for People with Disabilities, New York City Regional Innovation Node at CUNY and the New York State Commission for the Blind are some of the other partners. Other researchers on the project include: Jie Gong (SAT-Hub lead, Rutgers), Cecilia Feeley (co-PI , Rutgers), Camille Kamga (co-PI, CCNY), Bill Seiple (co-PI, Lighthouse Guild), Zheng Yi Wu (industrial partner, Bentley), Huy Vo (CCNY), Hao Tang (BMCC) and Jizhong Xiao (CCNY).